Dometic is pleased to invite media representatives attending this year's Palma Boat Shows to a press opening of Dometic Blinds Show Room in Puerto de Palma, Mallorca, Spain. 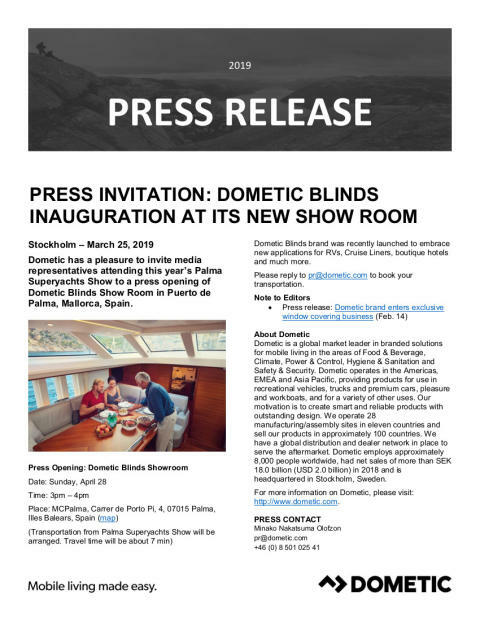 Dometic Blinds brand was recently launched to embrace new applications for RVs, Cruise Liners, boutique hotels and much more. Please reply to this email or email pr@dometic.com to confirm your attendance and book your transportation.